We all know about the French house legend Daft Punk. Whenever they release new material, they are instantaneously raised to deity status by the masses. And usually this is rightfully so, as each new release is simultaneously a completely new direction musically while retaining a certain level of mastery of their craft. But things weren't always this way. Though their debut album, Homework, has been praised as a boon to the house music genre, and it planted them squarely at the head of the French house movement of the time. Homework came out in 1997, but the duo had actually been working together under this moniker since 1993, and in that time, there was much growing to do. 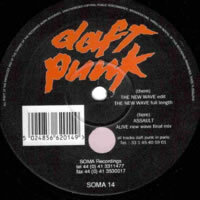 I can tell this because their very first release, "The New Wave", from back in 1994, falls short of what we would expect from Daft Punk. First up is The New Wave (Edit), which starts right off with pounding beats, a bit fuzzily, before waves of shivery static noise sneak their way in. It's fairly safe to assume these are the "new waves". This goes on for a while before some strange acid blurps make their way in to try and conquer the song. And then we get to listen to that for a few minutes with a few minor variations but nothing new to charm our pants off. Quite frankly, if you listen to The New Wave and then any track from their latest album, Random Access Memories, you would swear they are two completely unrelated music groups, and it's not hard to see why: Random Access Memories was a finely crafted work, beautifully orchestrated with hints of decades past strewn within. This song reminds me more of the time I stuck crayons in the VCR when I was five. So you can easily imagine what The New Wave (Full Length) is like: more of the same, just elongated for our displeasure. Next up is Assault, a trip through the world of the ol' TB-303 synthesizer, through emphasized solely through monotone clips. Once the brief bass-laden interlude is completed, the Punk duo switch things up with more frantic percussion and claps to keep our ears certifiably entertained. A second, sharper 303 effect is used later on, and it is interspersed through the remainder of the track. Never does it reach a plateau of any interest, however, settling to simply exist. But we're not through yet: there's still Alive (New Wave Final Mix). This is actually the same song that appears on their Homework album, and judging by the track name, this is what The New Wave eventually morphed into. It's darker and more richer, driven by a fuzzy bassline as more standard house beats and monotone soft synth stabs edge their way to the forefront. Though this isn't one of Daft Punk's finest works, it's definitely the top pick on this single. If Daft Punk had remained stagnant with songs like The New Wave and Assault, they probably wouldn't be as revered as they are now. Thank goodness they honed their craft and their skills over time because quite honestly, this package is probably among the worst they've ever put out. Yet everyone must starts somewhere, and it's still neat to see where the two Parisian punks started out on their journey.